I’ve known NAYLA SAVANNAH since starting this blog and it wasn’t until a couple of months ago that this young rapper has resurfaced and dropped her trip-hop number ‘Dial’. I’m soooo glad that she’s still on the scene as I hate to see such talent go to waste. Cementing her comeback to the scene, Nayla recently dropped her mixtape, ‘Bixby Beach’ which carries on the chilled out theme from her previous efforts, ‘Pretend’ (A MUST LISTEN) and ‘Cruisin’ – a theme that gives the mixtape a perfect introduction through the appropriately named ‘Welcome’. There were times that a boisterous bassline makes its presence known in the ten piece set through tracks, ‘Forest’ and ‘Thank You’, adding some real satisfying meat to the featherly soundscapes. Since her last appearance on NEW LEASE MUSIC, SAYSO has really stepped up her game. 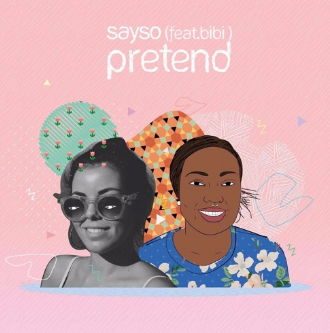 The LA-based hip-hop upriser once again teamed up with portuguese singer/songwriter Bibi Ross for the super slick single, Pretend, the first release from her sophomore mixtape, Bixby Beach dropping later in the year. Last year, the two have collaborated on the female emcee’s single Cruisin’ Ruff. Pretend is now available on iTunes. For now, check out the single – not to be missed!